WaterSHED’s Women’s Empowerment Program (WEP) was developed to engage more women in the water, sanitation, and hygiene (WASH) market. WEwork Collective is one component of the program, which provides women with business skills training, opportunities for mentorship, and a platform for the exchange of ideas. More than 200 women participated in WEwork from across the country. Two of these participants live in Kampong Cham province, 120 k.m. northeast of Phnom Penh. Ren Lek and Norng Sothy met through WEwork and used what they learned in WEwork to sell household WASH products – together. Although both Lek and Sothy live in the same neighborhood, the lives of these two women and their families are uniquely different. 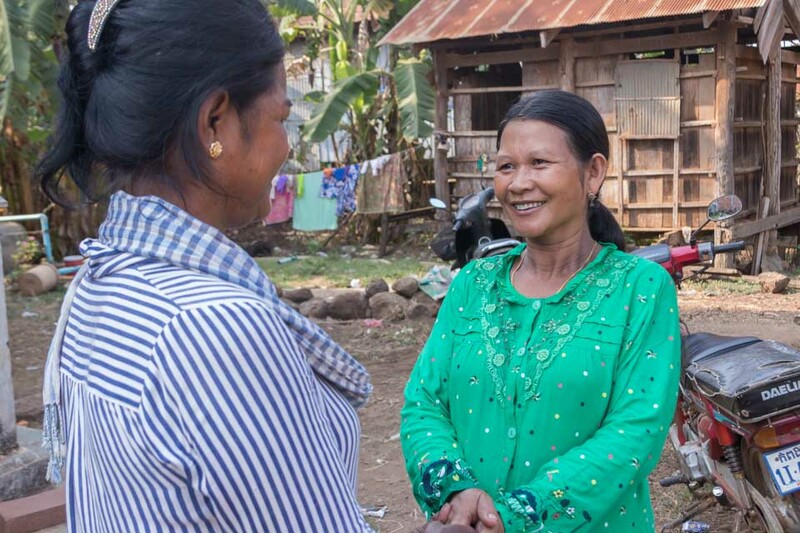 Lek, 50, takes care of her aging mother and three young children on her own. Two of the three children are her grandchildren left in her care by her son and daughter-in-law who migrated to Thailand for work nearly 10 years ago. Lek is an active community member and makes a small income as a farmer. A few doors down is Sothy who lives only with her husband. Her two children have grown up, become married, and moved away to start their own family. To earn a living, Sothy sells snacks and drinks at a primary school nearby. Her husband is a farmer. Because Sothy and her husband live in a double income household without dependents, she is in a more secure position than Lek. Despite their differing economic backgrounds, they both had an opportunity to join WEwork Collective and get to know each other better. At the workshops they were introduced to household WASH products – the ceramic water filter and HappyTap portable sink – sold by our sister company, WaterSHED Ventures. They bought the products for their personal use but quickly realized there was an opportunity to supplement their income by selling water filters and HappyTaps in their community. In March 2017, Lek, Sothy, and two other WEwork participants formed a group to promote WASH products in their village. Lek was responsible for managing sales, Sothy helped with capital investment by purchasing the initial inventory, and the other two members promoted the products in their respective villages. Because Lek was struggling financially, the team gave much of the profits over to her so she can support her family. Lek sold dozens of units of both HappyTap and the ceramic water filter. She says the key to her success was being an active sales agent rather than a passive one. Instead of setting up a stall in front of her house, the more traditional passive route to sales in rural Cambodia, Lek got on her motorbike and drove door-to-door promoting the products face-to-face. She already had influence and credibility as an active community member and health center volunteer. Her neighbours trusted her advice about the benefits of clean water and good hygiene. However, the challenges to selling WASH products go beyond convincing the household. Recently, NGOs entered the village to giveaway water filters or sell them at a highly subsidized price. As a result, her sales have taken a hit. Despite this, it has not deterred Lek from continuing to promote good WASH behaviours. “I’m not upset. As long as people in my community drink clean water and practice good hygiene, I’m happy enough. I would be more than happy to promote any hygiene products or water filters as long as people use it,” Lek said. Last November, Cambodia’s national government recognized her hard work at the 2nd National Sanitation Forum and Conference in Phnom Penh. “It was like I was in heaven,” Lek said. “I never imagined I would be invited to such an important event and be in such a great hotel. It was because of my hard work that I could reach this milestone. It was a great achievement for me and I am so very happy”.